Despite the source material, and the narrator’s references to theatrical convention, I thought Kris avoided staginess for the most part. A lot of this is due to the direction. 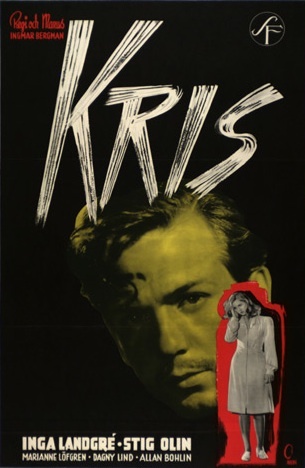 If Bergman had never made another film after this one, he almost certainly would not be remembered as a great director, but Kris still shows a lot of greatness. Also, Landgré, the 18 year-old actress who plays Nelly, is incredibly pretty and naturalistic, and the film wouldn’t work nearly as well as it does without her assured performance at its center. Nelly calls Ingeborg “Mutti” and calls her birth mother “Aunt Jenny.” Before Jenny shows up, Nelly and her mutti seem quite happy, although Nelly is beginning to champ at the bit, and longs for more excitement than her little town can offer her. Ingeborg also has a roomer, Ulf, played by the 38 year-old actor Allan Bohlin, who is in love with Nelly. She likes him, spends a lot of time with him, and affectionately calls him “Uffe,” but he’s too old to arouse her romantic interest. Ingeborg is destitute and in poor health. She borrows money from her elderly aunt and her cleaning lady. Nelly seems unaware of their financial difficulties, but when Jenny buys her a beautiful party dress for the ball she can’t wait to attend, it contrasts sharply with the simple dress Ingeborg purchased for her. Jenny, who is approximately 40 years old, also brings with her the reedy little 25 year-old dandy Jack (Stig Olin). Jenny refers to him as her “half-brother’s son,” but he’s clearly a gigolo who services her. Things come to a head at the ball, when Jack gets Nelly liquored up and starts an impromptu swing band session that scandalizes the older townspeople. He catches up with Nelly outside, and they enjoy a tryst by the lake until Ulf shows up, chastises Nelly, and beats up Jack. Back at home, Nelly hugs her mutti Ingeborg good night and tearfully says that she never wants to leave her. In the cold light of morning, however, with the gossipy townsfolk spreading word of the scandals the night before, Nelly runs off to the city with Jack and Jenny, and takes a job at Jenny’s beauty salon, called “Maison Jeannie,” and the love triangle between Nelly, her birth mother, and Jack plays itself out while Ingeborg suffers through loneliness and a single, painful trip to see Nelly in the city. The dramatic arc of Kris is nothing we haven’t seen before, but the acting and the direction elevate it. The textures in the film’s outdoor scenes are especially beautiful, and hint at some of what was to come in Bergman’s career. As someone who hates day-for-night photography, however, I felt that Bergman was a little too in love with the sun-dappled lake next to which Nelly and Jack have their rendezvous. For a scene that takes place at night, it couldn’t look any more like the middle of the afternoon. For the most part, however, I thought Kris was a very good film. Its attitude toward sexuality was a little more frank than American films of the time, and the human relationships in the film were nuanced and believable. I could have lived without having to look at Olin’s mustache the whole time, however. While its disturbing qualities were appropriate for his ne’er-do-well character, it was really hard to deal with. The poster above doesn’t really do its sleaziness justice. You have to see it for yourself. Posted in 1946, February 1946 and tagged Allan Bohlin, Crisis, Dagny Lind, Drama, Erland von Koch, Ernst Eklund, Foreign Films, Gösta Roosling, Harald Molander, Inga Landgré, Ingmar Bergman, Kris, Leck Fischer, Marianne Löfgren, Oscar Rosander, Signe Wirff, Stig Olin, Svensk Filmindustri, Swedish Cinema, Victor Sjöström. Bookmark the permalink.